On my MacBook Pro, I can see in the About this Mac → System Report → Power link, how many times the laptop has been charged. It lists the condition (currently as "Normal") on my laptop. I've seen it say something like "Needs Attention" or "Service Battery" when the laptop has over 500 cycle counts. Is there an app that shows me that same information on my iPhone or iPad? I would like to know this information for the future if I buy a used iPhone or iPad. I don't want to buy one where there's over 1000 cycle counts and the battery doesn't hold a charge longer than 30 min. I've tried a couple battery life apps on my phone but it doesn't tell me the cycle count. It just tells me the wear level and a percentage, which isn't exactly what I'm looking for. 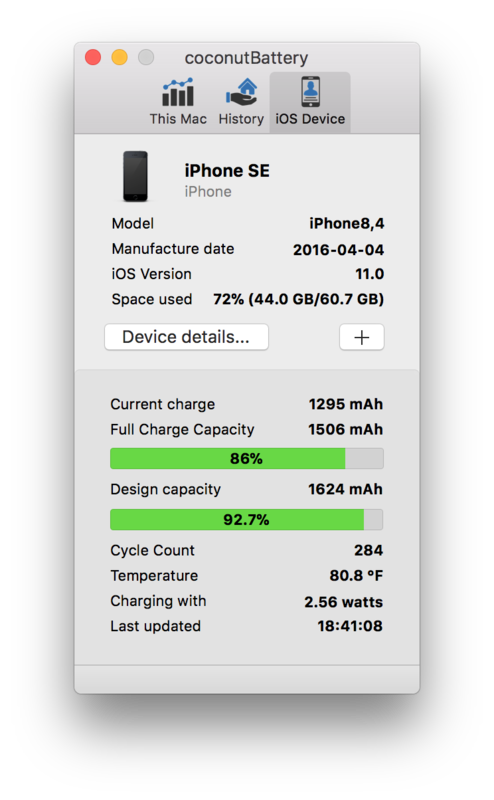 I have installed coconutbattery app for macOS. It gives this information and more for all the Apple devices that you connect (by cable, or WiFi for Pro version) on your Mac, both about battery, OS and charger. After installing the app, connect your iPad/iPhone, launch the app, click on the iOS Device tab and look for value corresponding to Cycle Count. Not the answer you're looking for? Browse other questions tagged iphone ipad applications battery charging . Charging a USB type-c equipped MacBook Pro with a non-Mac charger - would it harm the battery?